Slemish is very accessible, a drive steeply uphill through narrow lanes hemmed in by dry stone walls brings a carpark and visitor facilities at the height of 240m (217057 A). There are a number of informative boards on the history of the mountain - notably its volcanic origin. 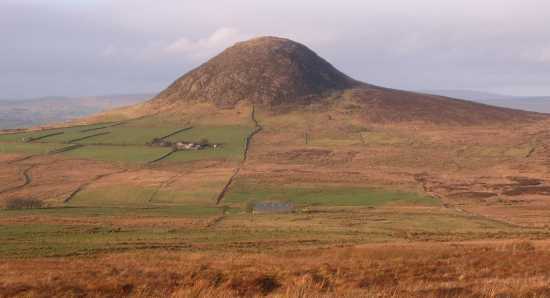 Slemish is steep and rocky and stands apart from most of the other Antrim Hills in this respect, looking like it would be more at home in Donegal or Connemara. Of course it is famous for its association with St. Patrick (the patron saint of this fair isle) who supposedly tended sheep on the hillside. On the 17th of March i am sure there would be an extra one or two feet making the climb to the top. There is a marked track to the summit, this is private land and walkers are invited to stick to the track. A gate leads to some rough stone steps which pass between a few tortured hawthorn trees, grazed grass and further steps bring steeper, rockier ground. The ground was partially frozen and in any sort of wet weather care is needed on the rocks and narrow track as it climbs steeply. The N end of the summit is reached in 20 minutes and then it is an easy walk along the length of the top, though today the wind would have lifted paint. The views from the summit are wide and impressive - looking E to the Irish sea, N to the higher Antrim Hills, W to the lowlands and rising Sperrins and S to the Belfast HIlls. There used to be a trig pillar and i am sure that in my early years there were other various structures atop, but none these days. The track drops of from the SW of the top to contour back to the carpark - dropped off the SE, some steep ground around big rocks. Then tracked NE towards Carrigin Hill (351m) (231058 B). This was over varied but mostly good ground to reach the small cairn at the top in a further 20 minutes. There are nice views back over towards Slemish and over the expanses of rough moorland. It would be quite easy to return to the carpark from here, either around the N or S side of Slemish.Decided to extend the trip with a tramp across wet moorland to Douglas Top (245029 C) some 3km to the S.